We’re roughly two weeks out from the arrival of the iPad, and the pre-orders are apparently pouring in. So far, most of the focus has been on the three Wi-Fi versions of the device, mostly because those of us who want to get our hands on an iPad now don’t want to wait until later in April, when the 3G-capable models arrive. But for regular users—for people who aren’t tech writers or software developers—I think the 3G-enabled iPad models have a whole lot going for them. And they deserve serious consideration, despite the wait. Now, the later ship date of the Wi-Fi plus 3G iPad models (keep in mind, all iPads include Wi-Fi) is not the only barrier that might make you consider not buying one. There’s a definite price difference. To get your hands on an iPad that supports the 3G cellular network, you’ll need to shell out $130 more than what you’d pay for a Wi-Fi-only model with the same amount of storage. But unlike just about every other cellular-connected device out there, buying the 3G iPad doesn’t actually commit you to paying a single penny to AT&T (the exclusive U.S. provider of the iPad’s 3G data plan). This is because Apple has cut a remarkable deal with AT&T, allowing iPad users to access AT&T’s network without any contracts or commitments. When you buy an iPad with Wi-Fi and 3G, you can use it happily without ever enabling the 3G features. Now, if you’re planning on never taking your iPad anywhere that doesn’t offer Wi-Fi, you can give up flexibility and save your $130. But how many people will never want to use their iPads on anything but Wi-Fi? Plenty of commuters don’t have access to Wi-Fi during their journeys. When you’re traveling, Wi-Fi can be hard to come by. The iPhone has taught us that it’s really, really nice to have a 3G data network available whenever you want. The iPad lets you auto-renew or auto-cancel 3G service. And this is where Apple’s deal with AT&T really pays off: When you say you want the option to use 3G on your iPad, all you’re paying for that option is $130. There’s no two-year commitment to pay $50 a month. Instead, when you suddenly find yourself somewhere with no Wi-Fi service, you can open up your iPad’s settings app and buy 250MB of data for $15, or an unlimited amount for $30. You can even tell the iPad to cancel the service when the month is over, so you don’t get stuck unwittingly paying for iPad data you’re not using. Let’s face it: One of the things that stinks about the American cellular industry is that it’s been built around a subsidy-and-contract business model. When you buy a phone, it’s generally discounted in exchange for your agreement to pay a monthly fee for a couple of years. Non-subsidized devices generally still pay high prices for service, and it’s still a pain to cancel. The iPad’s 3G service has none of these drawbacks: It can be set to auto-cancel and requires no commitment. Of course, there are some scenarios where buying a 3G iPad doesn’t make as much sense. If you really are never planning on leaving your house with your iPad, don’t bother with 3G. If you own a phone that offers Wi-Fi based tethering, so you can share your phone’s data connection via Wi-Fi, there’s no point in piling on. If you own a clever Wi-Fi cellular device such as the Eddy Award-winning Novatel Wireless MiFi, you’re already paying a monthly fee for data—and can share that data with your laptop, iPad, or any other device you can think of. My point isn’t that the iPad with Wi-Fi and 3G is for everyone. It’s that a lot of people may commit to a Wi-Fi only iPad without considering the flexibility of the iPad’s 3G system and the great deal Apple has extracted from AT&T. For an up-front commitment of $130—the cost difference between the Wi-Fi and 3G models—you give yourself the freedom to buy 3G data whenever you need it, without any of the typical cellular encumbrances. That’s pretty cool, and it’s worth considering when you’re deciding which iPad you want to buy. Finally, Apple is a company that prefers simplicity in its product lines. Right now the company is selling six different iPad models. That’s got to chafe a whole lot of people in Cupertino. And it’s a product line that can be simplified by eliminating the concept of a Wi-Fi-only iPad. Embedding cellular connectivity in devices is the future. 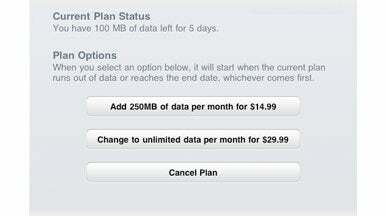 I’d imagine that, by this time next year, every iPad Apple sells will include cellular-data access. (It’ll certainly simplify the product line.) In the meantime, the question remains: Save $130 and cut yourself off from the 3G network, or spend the money and keep your options open? For a lot of people, saving the money will be the right call. But the 3G deal is so good that I’d give those higher-cost models some careful consideration first.